The decision was the latest sign that the two countries may be nearing an agreement, as they look for a way out of last year's punishing trade war. In a statement shared by the White House, Chinese President Xi Jinping hailed "progress" in the negotiations. US President Donald Trump also said a deal was "more likely" than not. "The fact that they're willing to stay for quite a bit longer... that means something," he told reporters at the White House. "I think there's a good chance that it happens." Where do talks stand now? The US and China placed tariffs on billions of dollars worth of the others' goods last year as they faced off on trade. The US had initially threatened to increase tariffs on $200bn worth of goods from 10% to 25% if the two sides could not agree a deal by 1 March. But Mr Trump has appeared more flexible recently, as negotiators meet in Washington for a fourth round of talks. 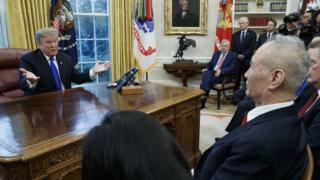 On Friday, Mr Trump did not commit to extending the deadline, but he did note progress, including an agreement on currency manipulation, the details of which were not disclosed. He also said he may meet with Mr Xi in March at his Mar-A-Lago resort. Huawei has not been part of the discussions to date, he added. China's Vice Premier Liu He, who has been leading the talks for the Chinese, said his team was "ready" for a deal. "From China, we believe that it is very likely that it will happen," he said. What are the two sides discussing? Washington wants Beijing to make changes to its economic policies, which it says unfairly favour domestic companies through subsidies and other support. China has offered to increase purchases of US goods, such as soybeans and semiconductors - a move that could reduce the US trade deficit, a focus for Mr Trump. However, the country is unlikely to embrace broader structural changes, which are seen by some internally as a way to contain its rise. On Friday, US Trade Representative Robert Lighthizer, who has been leading talks for the US, warned that "major hurdles" remain before a final agreement can be signed.